I thought I was the coolest person I knew because I made my own cultured butter. Then I decided I wanted to make my own Ricotta…I amaze myself. Grocery store Ricotta was so dry and crumbly, even gritty. I found a brand of ricotta that I really liked at a small market. It was smooth and creamy. The problem? It was a 30 minute drive and cost $7.99 for and 8 ounce container. It just didn’t make sense to drive so far and spend so much. I had a thought. If I can culture cream and make butter, surely I can make my own ricotta. Wouldn’t you know I had saved an article from a Bon Appetite magazine containing instructions on how to making ricotta. I went to work, but I wasn’t thrilled with the results. I just wasn’t getting enough curd out of a batch to make it worth my time and effort. I started to search and compare recipes. I made a few batches that were ok, but not great. That’s when I decided to combine a few recipes and techniques. Voila! I had the ricotta I had always dreamed of. It was smooth and so creamy and I could get about 3 1/2 pounds of curd from a batch. In a very large pot, pour in the gallon on milk. 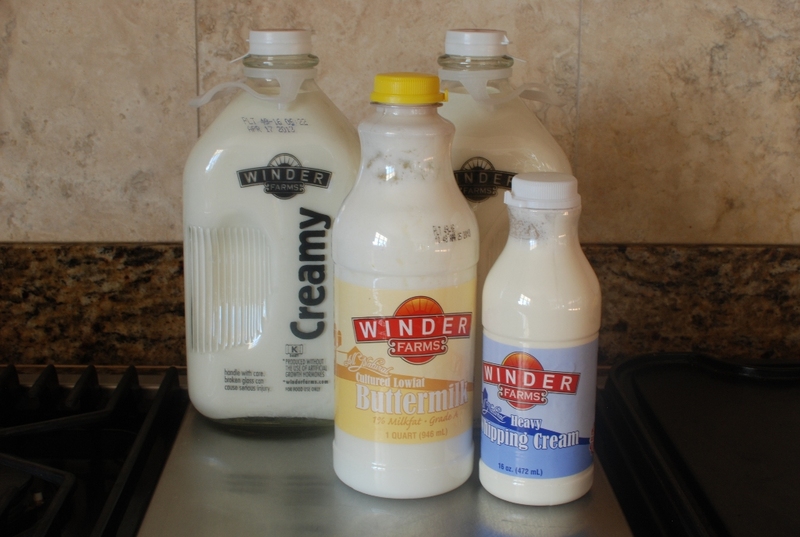 I’m using Winder Farms milk. I firmly believe in supporting local businesses and I know it’s fresh. To the milk add 1 cup cream. Heat over medium/low heat. Only stir occasionally so that the milk doesn’t scorch on the bottom of the pan. Clip on a thermometer. 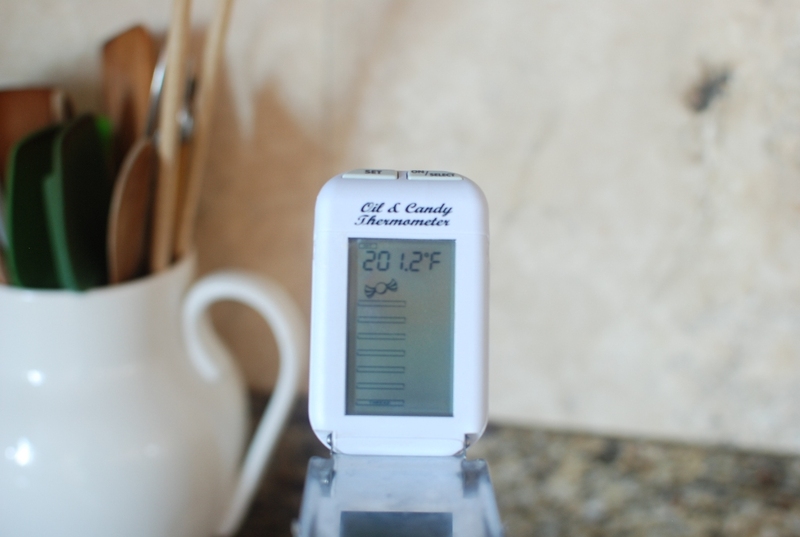 You can use a candy thermometer or an instant read thermometer. Heat the milk mixture until it reaches 200 degrees. I’m over by a degree. No problem. The mixture may begin to bubble just a bit. You will notice that some of the curd is beginning to form. Remove from the heat and let sit undisturbed for 30 minutes. Notice how the curd has formed and separated from the whey. I like to line a wire mesh strainer with four layers of cheesecloth. It really helps to wet the cheese cloth first. This way it will stay in place and hug the strainer. Place the strainer over a very large bowl or pot. Pour the warm ricotta/whey mixture into the strainer. You will need to stir the ricotta gently to help remove the liquid whey. I like to scrape the sides of the strainer along the cheese cloth to allow the liquid to drain out. You will be amazed at how much whey is left over. I had almost 3/4 of a gallon of whey. 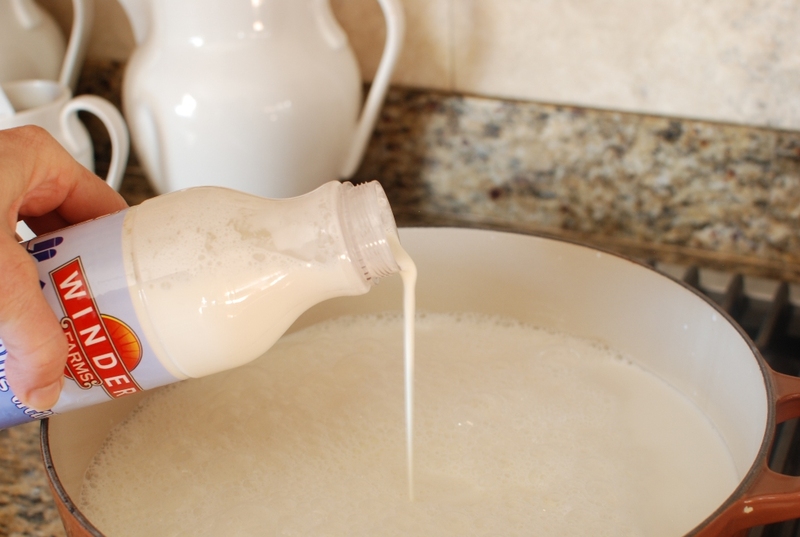 Don’t think you are wasting a full gallon of milk. This whey is good stuff. I use the whey in place of the water in the crusty bread recipe. It gives the bread a sour dough flavor. I have used the whey in pancakes and waffles. It’s great to have on hand. 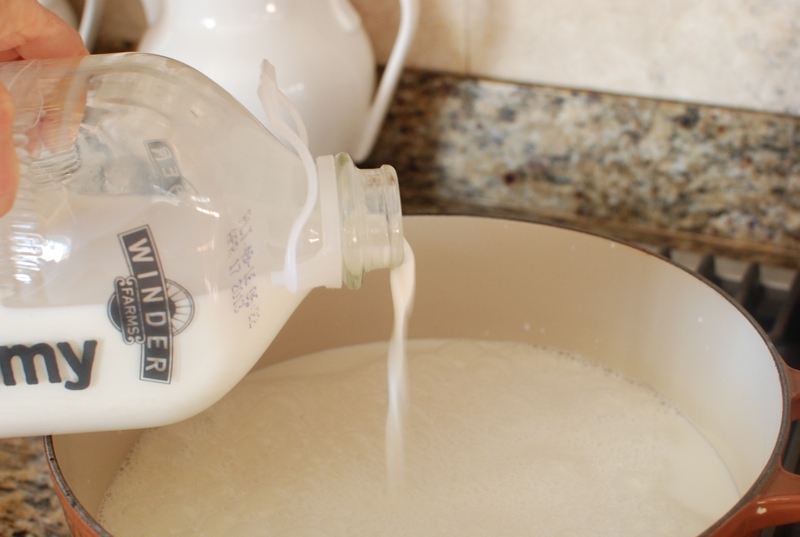 I pour the whey into the milk container, label it and return to the refrigerator for later use. I’m searching for other uses of whey. Please let me know if you use whey for anything wonderful. 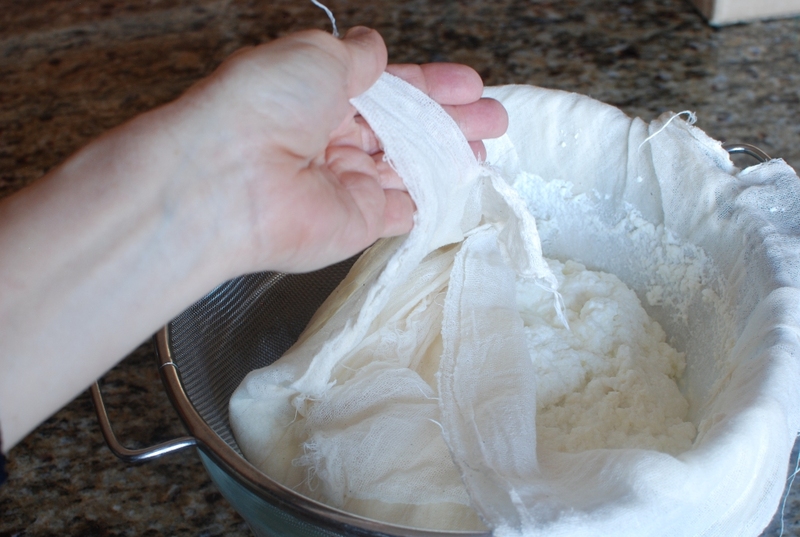 Fold the cheesecloth over the ricotta. Place this in the refrigerator over night or 24 hours. This will allow more of the whey to drain out of the ricotta. Remove the ricotta from the refrigerator. Notice that I have more whey that has drained off. 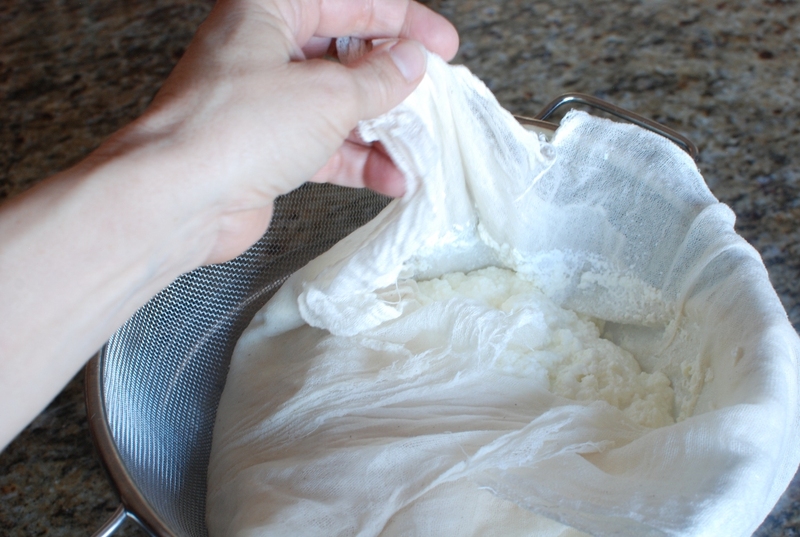 Remove the cheesecloth from the ricotta. I like to store my ricotta in glass containers with an airtight lid. Side note: Glass is a new kick I’m on. I have pitched all plastic and I now store in glass containers…just because. 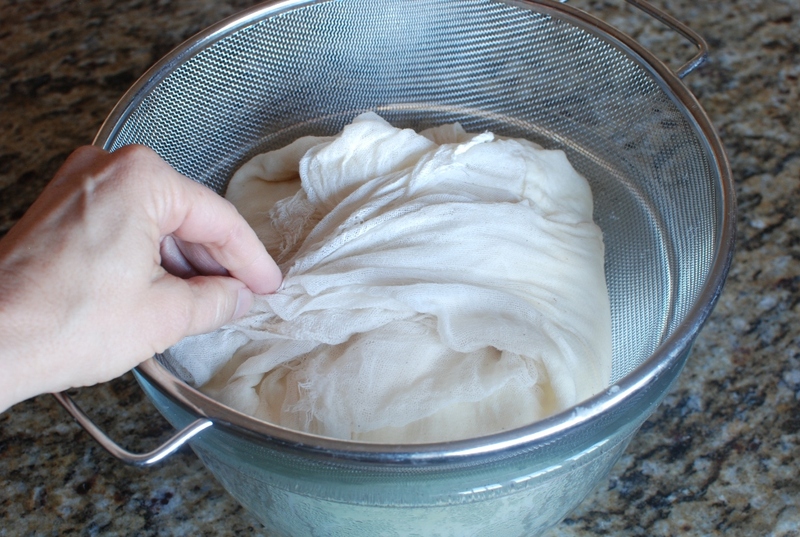 Another side note: I rinse out my cheesecloth and reuse it. I just wash it by hand and hang it to dry. It will last through several batches of ricotta. During the past 48 hours I have made Buttermilk Ricotta Gelato (post coming soon), Lemon Ricotta pancakes (out of this world amazing), Buttermilk Ricotta Gnocchi, Asparagus Ricotta Walnut pizzas, and Buttermilk Ricotta Omelette’s with spring chives. This is so creamy and delicious I can eat it with a spoon right from the jar. Please don’t send me a comment stating the amount of fat I have consumed. I don’t want to know! I’ll run it off tomorrow… or something…. This is so creamy and delicious I can eat it with a spoon right from the jar. Making your own buttermilk ricotta isn't too complicated. In a very large, heavy duty pot add the milk, cream and buttermilk. Heat over medium/low heat stirring only occasionally so the milk doesn't scorch on the bottom of the pan. On the pot, clip on a candy thermometer or use an instant read thermometer. 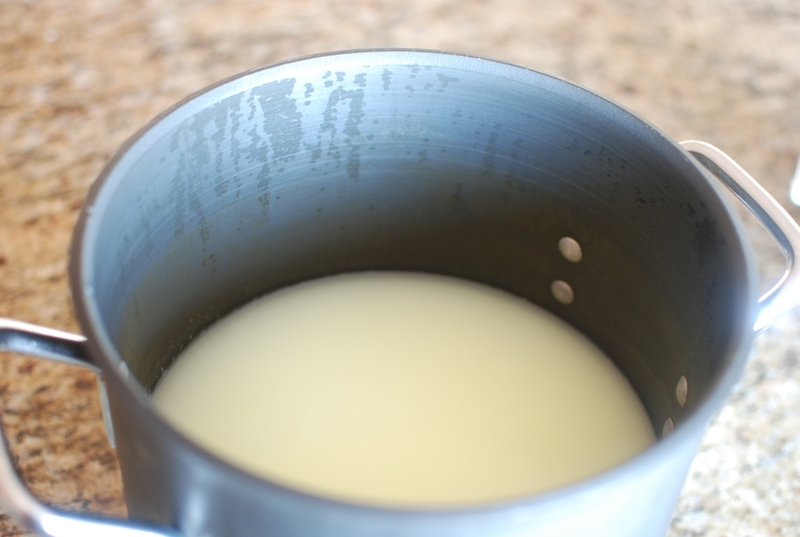 Heat the milk mixture to 200 degrees F. Remove from the heat and let the mixture stand for 30 minutes. Place a wire mesh strainer over a very large bowl or pot. 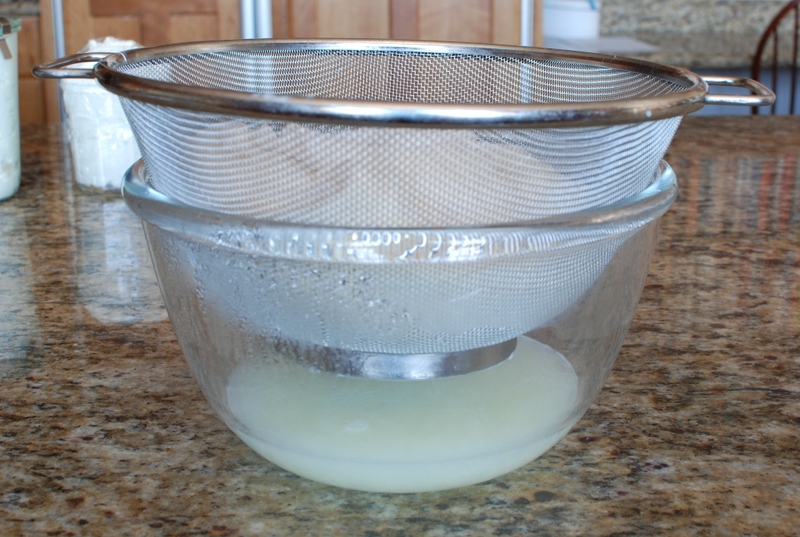 Pour the mixture through a wire mesh strainer that has been lined with 4 layers of cheesecloth. 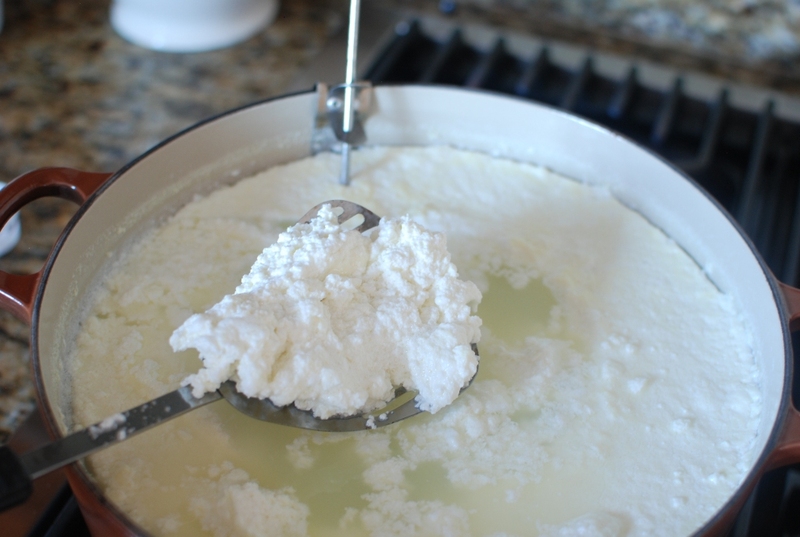 Gently stir the curd to release the liquid or whey from the ricotta. 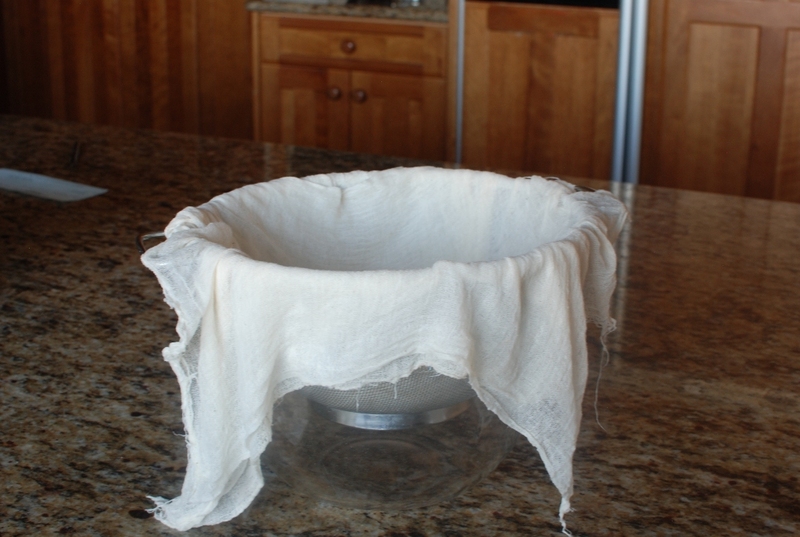 Cover the ricotta completely with the ends of the cheesecloth. Leave in the strainer and place in the refrigerator over night or for 24 hours. 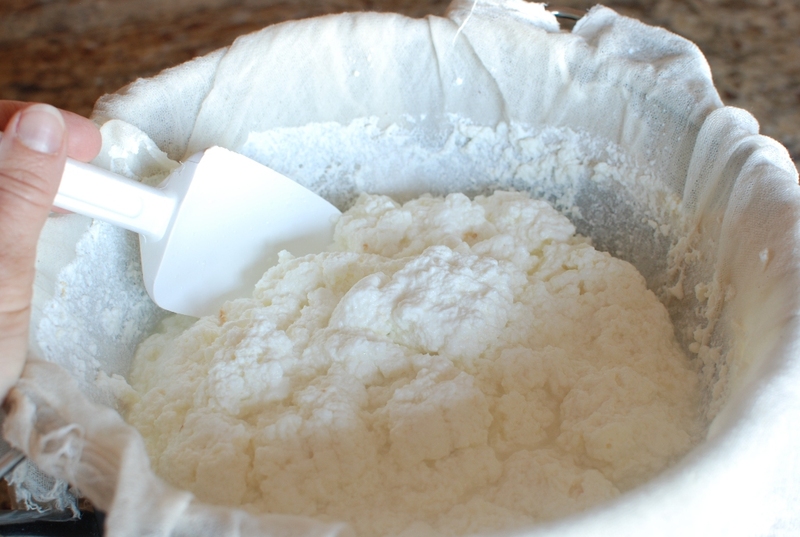 Transfer ricotta to an airtight container and refrigerate until ready to use. Ricotta will last for about 7-10 days. Yield: 3 - 3 1/2 lbs. I felt so grown-up making my own ricotta! This ricotta recipe along with your ricotta gnocchi is an absolute game changer! Thanks for sharing!! Thank you. Isn’t homemade ricotta so amazing? I appreciate your comment. You can use whey as a fertilizer in your garden. I buy fresh milk (unpasteurized) and it only lasts about a week. One of my friends told me to pour out into my garden and my plants will explode. And…they did! It's all natural fertilizer. Great idea. I actually had a problem with my tomatoes this year and I poured some milk that was ready to expire on them and they perked right up. Such a great suggestion. thank you so much. Even easier way to make ricotta is kefir freezing .just put tetra pack of kefir into the freezer and let it freeze . Remove from the freezer and drain the same way . That's it ! Seriously? 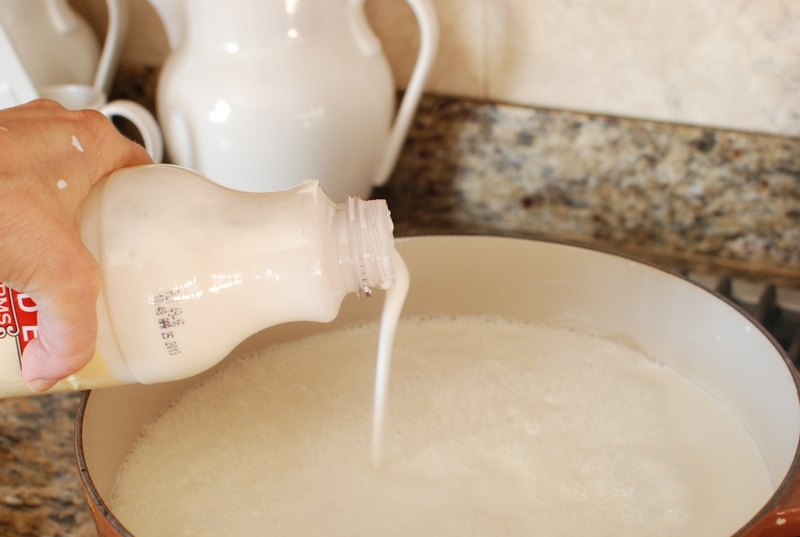 Do you purchase your kefir or do you make your own. I always wondered as to how Ricotta is made at home with minimum pain!Thanks Janet, now i got it & am going to make it for sure. All the ingredients are readily available here at my location. Buttermilk is acidic. It will make the milk curdle just as lemon juice or vinegar. I personally have had better luck and greater yield using the buttermilk method. Very interesting recipe. It is very difficult to get Ricotta Cheese here in Tri -City Chandigarh. Thanks for this step by step method. I will try this one with Buttermilk. Im so sorry to respond so late. This comment slipped right past me. I am not familiar with using raw milk. I would assume you could follow same directions. The use of lemon juice should work in place of vinegar. I have noticed that making cheese of any kind can be a science. I generally follow recipes exactly as written. I have had many failures, but I think you should definitely experiment using your own milk, which is awesome. Are you wanting to keep the ricotta raw as well? Is that why you don't want to heat it? Hi Janet. I felt that although this post is a bit more than a year old that it deseved revisiting. 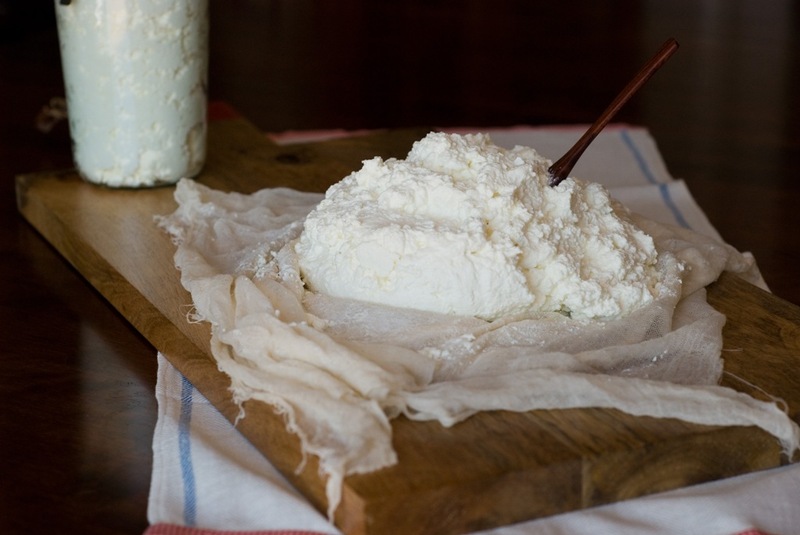 As regards the raw milk, I haven't ever used it to make ricotta but I've seen recipes for ricotta that do call for it. Your recipe should work as written without needing to use lemon juice/vinegar & I would definitely heat the milk. While the lemon juice or vinegar would indeed curdle the milk, it would be more like soured milk, it would not form enough curd. In other words, it would fail. That's a lot to waste. Hope this helps. By the way, use that leftover whey in soup. That sounds so delicious. I can't wait for my garden tomatoes later this summer and I will definitely give this a try. Thank you so much for passing on such a great idea. I will NEVER buy premade Ricotta ever again! This recipe is beyond amazing. I did cut it in 1/2 for the first try and I was not disappointed. I ended up with some fantastic creamy, rich and flavorful Ricotta. I used it to make lasagna. And DEFINITELY DO NOT toss out the whey – I had enough left over to make 3 loaves of your crusty bread. Sartori Cheese has an olive oil, rosemary, Asiago Cheese. I grated a wedge, added it to the dough, along with some additional fresh rosemary and a bit of garlic – so yummy! I then made 2 plain loves of bread. My family and I thank you very much. Thank you so much. I agree, why buy Ricotta ever again. Your bread recipe sounds amazing. I'll have to make it soon. Thanks for sharing the recipe and like you say, definitely do not toss the whey. Oh ya! This is screaming for a lot of things. Pancakes, tarts, crepes, but I like your idea for poundcake the best. I'm with you on gritty ricotta. Just watch the ricotta as the whey drips out. You can adjust the creamy texture by draining out LESS of the whey. Drain the ricotta for less time will make it creamier. The addition of herbs would be wonderful. with the excess whey you can boil it for about 4 minutes. 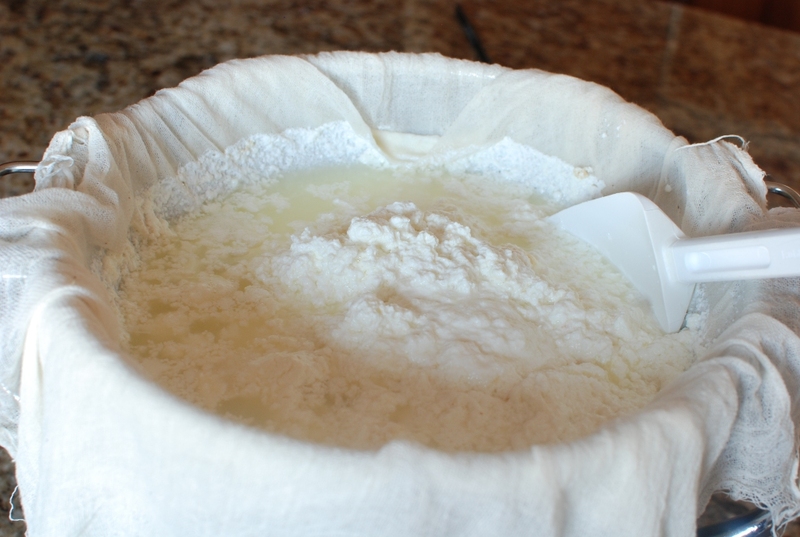 strain the liquids through the cheesecloth and presto you have an additional batch of Whey Ricotta. I do this all the time after I make my whole milk Ricotta. I have tried to boil the whey, but I didn't have a great yield. Maybe I didn't boil it long enough. I will try it again. I end up using the whey for making bread. It gives it a sourdough taste. I love your food blog, you are informative and correct recipes where needed, I also like others that have informative info. 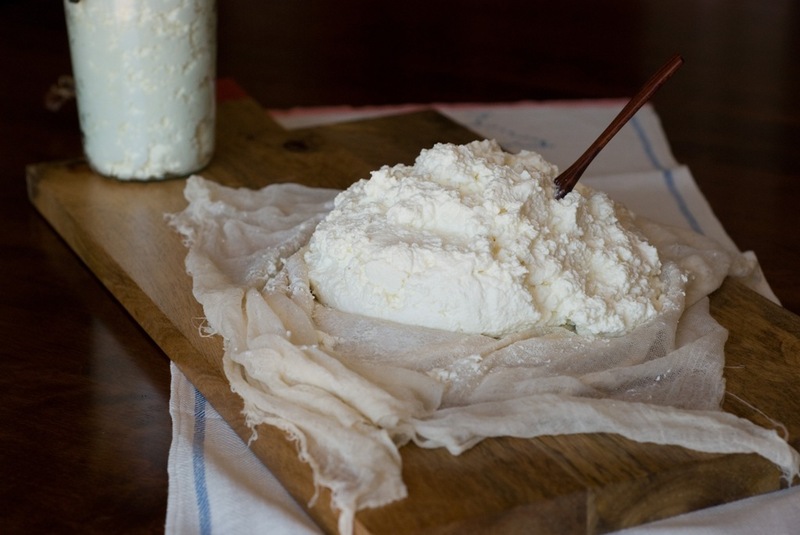 So, do you think this ricotta would turn out with low fat dairy products? Hi Laurie, Thanks for your kind comments. I have tried ricotta using only 2% milk and I have to say I didn't get much curd from the process. I wasn't happy with the final results until I added the cream to the whole milk…sadly. You can always try it, but your yield may not be as much. Let me know if you have success. You really do have to try this. It's amazing. I'm so glad you found my blog. I hope you keep coming back. I tired the vinegar trick and it didn't yield much of anything for me…Oh well! It could be that we live at a much higher elevation than sea level and that has something to do with all that kitchen chemistry. I did discover though that I could freeze my homemade ricotta without any kind of negative effect on the flavor, texture, or taste! After making a Martha Stewart ricotta and kale ravioli, I had leftover ricotta and I was leaving town. Not trusting my family to remember it was in the refrigerator, I threw it in a freezer ziplock and tossed it in the freezer. I took it out about a week later and just left it in the refrigerator to thaw and it is just the same! I think next time I make this, I may freeze the ricotta in 1or 2-cup increments so I can grab and go with whatever recipe I am making at the moment! I realize I only left my ricotta in the freezer for a week (so I don't know about freezing it for 3 months or so) but am confident that it will freeze well enough to make sure not one single delectable crumb will go to waste!! Woo HOO! I tried the vinegar as well and had the same results. I love that you can freeze the ricotta. My kids claim I put ricotta in EVERYTHING these days…well almost everything. I'm curious about bottling the whey. How do you do that? I made my buttermilk ricotta today and it turned out like a dream! My kiddos couldn't wait until tomorrow for it to drain more so I slathered some of it on some toast and topped it off with some homemade freezer strawberry jam I made today…they thought they had died and gone to heaven! I am going to try the whey and vinegar trick and see if I can't squeeze out some more ricotta before bottling the whey…thanks for another superb recipe!!!! Holy cow, woman. You are amazing. Let me know how the vinegar and whey works. I haven't taken the time to try it out yet. You have one lucky family…I hope they realize it. Just remember that whatever you use the leftover whey for after having added vinegar or lemon juice to it, you WILL be adding the flavor of vinegar or lemon juice. This is not necessarily a bad thing, it depends what you're using it in. I've made ricotta using each one and used the leftover whey as well. I must say however that buttermilk makes the very best ricotta, the texture & flavor are absolutely luscious. Hmmm…I must have done something wrong — I just ended up with warm milk with a little skim on top—smells a lot like vanilla pudding. 🙂 Do you know if I can go ahead and use it to cook a custard pudding? Since all it is is the buttermilk and cream, etc. I'm guessing I can just use it to cook with? This is what I would do. Pour the contents back into a large pot and add about 1/4 cup lemon juice. Repeat the same process. I hope this works. It's too pricey to dump. And, yes, you can always use it for baking. Let me know if this doesn't work and we'll try something else…it should do the trick. Please, oh please share that buttermilk ricotta gnocchi recipe! You got it. Give me a week or two. I'm heading out of town and will be back next week. I'll get on it then. Let me tell you…you really have something to look forward to. It's amazing. If you eat grains and legumes, you can soak either in the whey over night, instead of doing it in plain water, before cooking them the next day. It will infuse them with nutrients and will make the cooking time shorter. I just love all of the ideas and comments regarding whey. Now I know what to do with the two gallons that I have stashed in my refrigerator. Thank you so much. 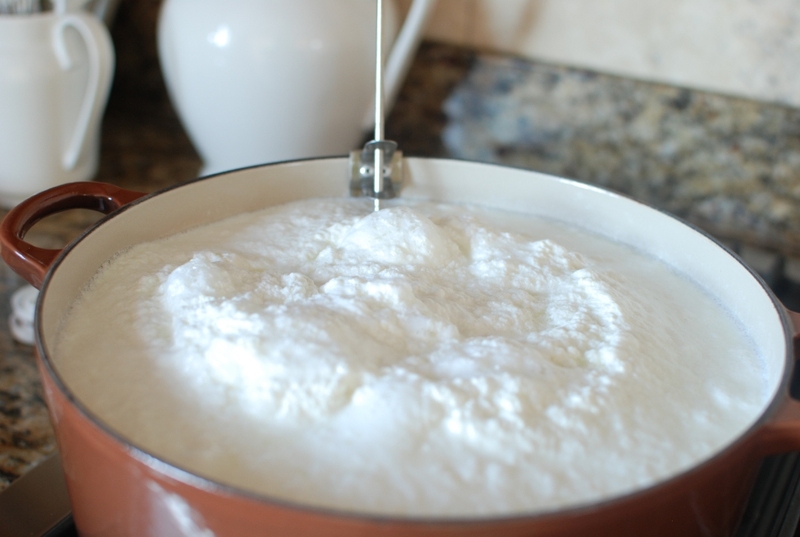 Ricotta is also very expensive in Quebec and I do want to try to make my own! I have seen several receipes from time to time, but yours again is so detailed and attractive, I will surely give it a try. Thank you so much for sharing. Hi Beah, Thank you for your kind comment. I hope you enjoy your ricotta. Let me know how it works for you. Just wanted to let you know that if you wanted you can heat the whey again till the 190, 200 degree mark, add two tbs of white vinegar stir allow to rest and you will see more ricotta form. It will not be as thick or rich as the first batch; but it is good none the less. I have been reading a lot about making ricotta from whey. Thanks for the confirmation. 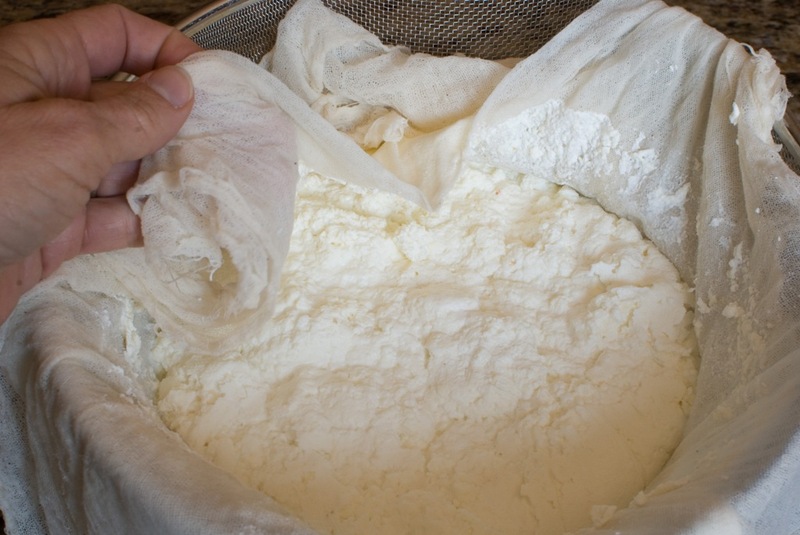 I was wondering if I could make more ricotta using the whey that came from making ricotta….you know what I mean. I'll try it. Thank you so much. This is something I have wanted to try and it looks like you've worked out all the kinks. I'll pin your recipe and give it a go. I do want to commend you on supporting local food producers and I'm in total agreement on using glass and tossing the plastic! You're a girl after my own heart. I'm so glad we have something in common. Go local! Janet, we just heard about the explosions in the Boston marathon, is everybody you know ok? Thank you for your concern. My sister-in-law was running and my brother was 50 ft away from the 2nd explosion. My sister-in-law was a few miles away and didn't know anything had happened until she got a call from my brother. It took about 2 hours for them to reunite. She was very cold. They had many small miracles and made it back to their hotel later that night where there daughter and her baby had been held up. We have been very upset and grateful that they are safe and that we decided not to run this year. I'm sorry to hear that they've been through it and I'm glad that they are well and that the kids weren't there. Our hearts are with you all. Thank you so much. The event was horrific. Ohh, I'm going to try that salad!! If you use the whey in the garden, mix it with water (abot 3 parts whey/ 7 parts water) and watch that it doesn't soak the soil. It can be very acidic and some plants do not like that ( I've killed some pretty tulips that way ;( ). More great advice. Thank you so much. That looks great!! I have not eaten lunch yet, I imagine that creamy and perfect ricotta with honey and lemon zest over a toast and mi stomach roars! Have you tried adding a bit of some kind of salt to the milk before heating it up? We used to make several types of cheese back in high school, and I remember adding table salt and/ or potassium citrate to separate the solid from the liquid phase. It also helped to preserve the ricotta for three or four weeks. The whey is really good for the garden, helps to get ride of acari and some fungus. Remember the citrus trees? Well, they're organic, so we spray them, and the herb garden, every two weeks with unsalted whey to keep them healthy. You are a wealth in information. I have not tried adding salt, but I will. I generally salt the ricotta depending upon what I'm using it for. We mixed a little salt, sugar and orange zest in some ricotta then put a dollop on top of an arugula and orange salad. It was divine. I will definitely try the whey on my garden. Right now I have 2 gallons. Thank you once again for a great comment and helpful tips. YUM! I can't wait to try this. I have access to raw milk from a neighbor farmer at a reasonable cost and would love to try my hand at making cheese. This sounds like a good recipe to start with. You are so lucky. I can't wait to here about your results using raw milk. It should be fabulous. Good Morning Janet, Home made buttermilk ricotta cheese… I would never have thought of making my own, but thanks to your wonderful step by step instructions, I am certainly going to give this a go, as ricotta cheese is so expensive here in England as well. Do you know, my file is filling up with your wonderful recipes. Thank you for this tutorial. Enjoy your day. Hi Daphne, I hope you try the ricotta. It's fabulous. Your comment just made my day. Thank you so much.